On the eighth day a boy is to be circumcised. Any uncircumcised male, who has not been circumcised in the flesh, will be cut off from his people; he has broken my covenant. During the 1st century BC there was a controversy in Judaism relating to whether or not a proselyte who was already circumcised needed to be ritually re-circumcised. This is done via a pinprick creating a drop of blood and is still practiced to this day. A similar controversy between the Shammaites and the Hillelites is given (Shab. 137a) regarding a proselyte born circumcised: the former demanding the spilling of a drop of blood of the covenant; the latter declaring it to be unnecessary. The rigorous Shammaite view, voiced in the Book of Jubilees (l.c. ["in the place cited"]), prevailed in the time of King John Hyrcanus, who forced the Abrahamic rite upon the Idumeans, and in that of King Aristobulus, who made the Itureans undergo circumcision (Josephus, Antiquities of the Jews, xiii. 9, § 1; 11, § 3). According to Esther 8:17, Septuagint, the Persians who, from fear of the Jews after Haman's defeat, "became Jews," were circumcised. Jewish sources vary on whether or not circumcision of proselytes was a universal practice in tannaitic times. Rabbi Joshua says that if a proselyte is immersed but not circumcised this is valid. Because our mothers where immersed but not circumcised. Rabbi Eliezer says the opposite. Because such was found regarding our fathers. However the sages say both are required. Rabbi Eliezer says only circumcision is required the same as in B. Yevamot 46a. Rabbi Joshua says both are required. During tannaitic times uncircumcised semi-converts also existed, see God-fearer and Ger toshav. According to the Gospel of Luke, Jesus was circumcised eight days after his birth, in accordance with Mosaic Law. 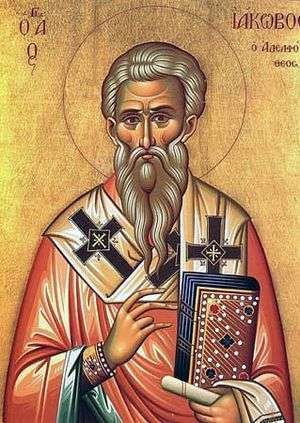 Icon of James the Just, who issued the Apostolic Decree (Acts 15:19-21) at the Council of Jerusalem, c. 50 AD. Similar differences and disputes existed within Early Christianity, but disputes within Christianity extended also to the place of Mosaic Law or Old Covenant in general in Christianity. This is particularly notable in the mid-1st century, when the circumcision controversy came to the fore. Alister McGrath, a proponent of Paleo-orthodoxy, claimed that many of the Jewish Christians were fully faithful religious Jews, only differing in their acceptance of Jesus as the Messiah. As such, they tended to be of the view that circumcision and other requirements of the Mosaic Law were required for salvation. Those in the Christian community who insisted that biblical law, including laws on circumcision, continued to apply to Christians were pejoratively labeled Judaizers by their opponents and criticized as being elitist and legalistic. The Council of Jerusalem of about 50 AD was the first meeting in early Christianity called upon to consider the application of Mosaic Law to the new community. Specifically, it had to consider whether gentile converts to Christianity were obligated to undergo circumcision for full membership in the Christian community, but it was conscious that the issue had wider implications, since circumcision is the "everlasting" sign of the Abrahamic Covenant. Jewish culture was still trying to find its place in the more dominant Hellenistic culture which found circumcision to be repulsive. The decision of the Council, called the Apostolic Decree, was that most Mosaic Law, including the requirement for circumcision of males, was not obligatory for gentile converts, in order to make it easier for Jewish-Christian proselytizers to induce gentile prospects to join the Christian movement. The Council did retain the prohibitions against eating meat containing blood, or meat of animals not properly slain, and against "fornication" and "idol worship". There is a view that 'strangled' and 'blood' in the texts refer to foreskin conditions - paraphimosis and ruptured frenulum, respectively. Beginning with Augustine of Hippo, many have seen a connection to Noahide Law, while some modern scholars reject the connection to Noahide Law and instead see Leviticus 17-18 as the basis. The Decree is one of the first acts differentiating the Church from its Jewish roots, though a similar dispute was taking place at the same time within Judaism, but which came to a contrary conclusion. Artist depiction of Saint Paul Writing His Epistles, 16th century (Blaffer Foundation Collection, Houston, Texas). 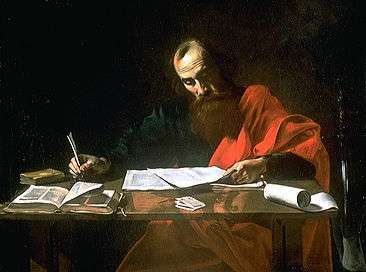 Most scholars think Paul actually dictated his letters to a secretary. Paul, who called himself Apostle to the Gentiles, attacked the practice, though not consistently. In the case of Timothy, whose mother was Jewish Christian but whose father was Greek, he personally circumcised him "because of the Jews" that were in town. He also appeared to praise its value in Romans 3:1-2. Two interpretations exist of Paul's comment on those wanting to force circumcision on Gentile Christians in Galatians 5:12. The KJV reading "I would they were even cut off" suggests cut off from the Church, but most modern versions, following scholars such as Lightfoot, R. C. H. Lenski and F. F. Bruce, read as the ESV "I wish those who unsettle you would emasculate themselves!" - due to a reading of the Greek text apokopsontai "be cut off" as Paul wishing that the circumcisers would castrate themselves. This parallels κατατομή katatomē. Eusebius reported that the early Christian Origen did in fact castrate himself, though following Matthew 19:12. Paul argued that circumcision no longer meant the physical, but a spiritual practice. (Romans 2:25-29) And in that sense, he wrote: "Is any man called being circumcised? let him not become uncircumcised" (1 Corinthians 7:18) - probably a reference to the practice of epispasm. Paul, on the other hand, not only did not object to the observance of the Mosaic Law, as long as it did not interfere with the liberty of the Gentiles, but he conformed to its prescriptions when occasion required (1 Corinthians 9:20). Thus he shortly after circumcised Timothy (Acts 16:1-3), and he was in the very act of observing the Mosaic ritual when he was arrested at Jerusalem (Acts 21:26). According to Acts, Simon Peter condemned required circumcision of converts. When the various passages from the New Testament regarding circumcision are gathered together, a strongly negative view of circumcision emerges, according to Michael Glass. Some Biblical scholars think that the Epistle to Titus, generally attributed to Paul, but see Authorship of the Pauline epistles, may state that circumcision should be discouraged among Christians, though others believe this is merely a reference to Jews. Circumcision was so closely associated with Jewish men that Jewish Christians were referred to as "those of the circumcision" or conversely Christians who were circumcised were referred to as Jewish Christians or Judaizers. These terms (circumcised/uncircumcised) are generally interpreted to mean Jews and Greeks, who were predominate, however it is an oversimplification as 1st century Iudaea Province also had some Jews who were not circumcised, and some Greeks (called Proselytes or Judaizers) and others such as Egyptians, Ethiopians, and Arabs who were. A common interpretation of the circumcision controversy of the New Testament was, that it was over the issue of whether Gentiles could enter the Church directly or ought to first convert to Judaism. However, the Halakha of Rabbinic Judaism was still under development at this time, as the Jewish Encyclopedia notes: "Jesus, however, does not appear to have taken into account the fact that the Halakha was at this period just becoming crystallized, and that much variation existed as to its definite form; the disputes of the Bet Hillel and Bet Shammai were occurring about the time of his maturity." This controversy was fought largely between opposing groups of Christians who were themselves ethnically Jewish, see section Jewish background above. According to this interpretation, those who felt that conversion to Judaism was a prerequisite for Church membership were eventually condemned by Paul as "Judaizing teachers". The source of this interpretation is unknown; however, it appears related to Supersessionism or Hyperdispensationalism (see also New Perspective on Paul). In addition, modern Christians, such as Ethiopian Orthodox and Coptic Orthodox still practice circumcision while not considering it a part of conversion to Judaism, nor do they consider themselves to be Jews or Jewish Christians. R. Emden, in a remarkable apology for Christianity contained in his appendix to "Seder 'Olam" (pp. 32b-34b, Hamburg, 1752), gives it as his opinion that the original intention of Jesus, and especially of Paul, was to convert only the Gentiles to the seven moral laws of Noah and to let the Jews follow the Mosaic law — which explains the apparent contradictions in the New Testament regarding the laws of Moses and the Sabbath. Today, most Christian denominations are neutral about ritual male circumcision, not requiring it for religious observance, but neither forbidding it for cultural or other reasons. The practice is customary among the Coptic, Ethiopian, and Eritrean Orthodox Churches, and also some other African churches. Some Christian churches in South Africa oppose circumcision, viewing it as a pagan ritual, while others, including the Nomiya church in Kenya, require circumcision for membership, despite St. Paul's warnings against those who required circumcision for salvation, in his epistle to the church of Galatia. The Greek Orthodox Church does not advocate circumcision among its adherents, but celebrates the Feast of the Circumcision of Christ on 1 January, while Orthodox churches following the Julian calendar celebrate it on Gregorian 14 January. The Orthodox Church considers it one of the twelve "Great Feasts". In the Catholic, Anglican and Lutheran churches, the commemoration of the circumcision of Christ has been replaced by other commemorations. Both religious and non–religious circumcision is common in some predominantly Christian countries such as the United States, but outside of the Jewish and Muslim communities, not for reasons of religious observance; see circumcision controversies, especially the section on the role of the 19th century Kellog brothers, who advocated circumcision of boys to discourage masturbation. It may be significant that Jewish applicants to American medical schools comprised 60% of all applications in the 1930s, at a time when circumcision was becoming popular in the US. Circumcision is common in the Philippines, South Korea, Australia, and Canada. Circumcision is near universal in the Christian countries of Oceania and in North and West Africa and it is common in countries such as the Cameroon, Democratic Republic of the Congo, Ethiopia, Eritrea, Ghana, Liberia, Nigeria and Kenya, and is also widely practiced among Christians from Egypt, Syria, Lebanon, Jordan, Palestine, Israel, and North Africa. Circumcision is less common in Europe, East Asia and Latin America. It is practiced amongst some Indian Christians. ↑ Florentine Bechtel 1910 Catholic Encyclopedia: Judaizers: Council of Jerusalem (A.D. 50 OR 51): "But to still the clamours of the converts from Pharisaism who demanded that the Gentile converts "must be circumcised and be commanded to observe the Law of Moses", the matter was discussed in a public meeting. ... By the decree of the Apostles the cause of Christian liberty was won against the narrow Judaizers, and the way smoothed for the conversion of the nations. The victory was emphasized by St. Paul's refusal to allow Titus to be circumcised even as a pure concession to the extremists (Galatians 2:2-5)." ↑ Brenton's translation of Esther in the Septuagint 8:17: "in every city and province wherever the ordinance was published: wherever the proclamation took place, the Jews had joy and gladness, feasting and mirth: and many of the Gentiles were circumcised, and became Jews, for fear of the Jews." 1 2 3 4 5 Lawrence H. Schiffman (1985). Who was a Jew?. Library of Congress Cataloging. Manufactured in the United States of America. pp. 32–38. Retrieved 2014-01-14. ↑ McGrath, page 174: "Paul notes the emergence of a Judaizing party in the region — that is, a group within the church which insisted that Gentile believers should obey every aspect of the law of Moses, including the need to be circumcised. According to Paul [reference is made to Galatians, but no specific verse is given], the leading force behind this party was James ... the brother of Jesus ..."
↑ Karl Josef von Hefele's Commentary on canon II of Gangra notes: "We further see that, at the time of the Synod of Gangra, the rule of the Apostolic Synod with regard to blood and things strangled was still in force. With the Greeks, indeed, it continued always in force as their Euchologies still show. Balsamon also, the well-known commentator on the canons of the Middle Ages, in his commentary on the sixty-third Apostolic Canon, expressly blames the Latins because they had ceased to observe this command. What the Latin Church, however, thought on this subject about the year 400, is shown by St. Augustine in his work Contra Faustum, where he states that the Apostles had given this command in order to unite the heathens and Jews in the one ark of Noah; but that then, when the barrier between Jewish and heathen converts had fallen, this command concerning things strangled and blood had lost its meaning, and was only observed by few. But still, as late as the eighth century, Pope Gregory the Third 731 forbade the eating of blood or things strangled under threat of a penance of forty days. No one will pretend that the disciplinary enactments of any council, even though it be one of the undisputed Ecumenical Synods, can be of greater and more unchanging force than the decree of that first council, held by the Holy Apostles at Jerusalem, and the fact that its decree has been obsolete for centuries in the West is proof that even Ecumenical canons may be of only temporary utility and may be repealed by disuse, like other laws." ↑ Harris, Stephen L., Understanding the Bible. Palo Alto: Mayfield. 1985. p. 316-320. Harris cites Galatians 6:11, Romans 16:22, Colossians 4:18, 2 Thessalonians 3:17, Philemon 19. Joseph Barber Lightfoot in his Commentary on the Epistle to the Galatians writes: "At this point [Galatians 6:11] the apostle takes the pen from his amanuensis, and the concluding paragraph is written with his own hand. From the time when letters began to be forged in his name (2 Thessalonians 2:2; 2 Thessalonians 3:17) it seems to have been his practice to close with a few words in his own handwriting, as a precaution against such forgeries... In the present case he writes a whole paragraph, summing up the main lessons of the epistle in terse, eager, disjointed sentences. He writes it, too, in large, bold characters (Gr. pelikois grammasin), that his handwriting may reflect the energy and determination of his soul." ↑ McGrath (2006). Pp 174-175. ↑ McGarvey on Acts 16: "Yet we see him in the case before us, circumcising Timothy with his own hand, and this 'on account of certain Jews who were in those quarters.'" ↑ Thomas Marberry, Robert E. Picirilli, Daryl Ellis Galatians through Colossians 1988 p90 "The main problem concerns the meaning of the phrase "I would they were even cut off. ... often used to describe some type of bodily mutilation such as castration (Lightfoot 207; Lenksi 272; Bruce, Galatians 238; Arndt and Gingrich 92)." ↑ "Origen of Alexandria". ReligionFacts. 2006-02-20. Retrieved 2008-10-03. ↑ Bechtel, Florentine. Herbermann, Charles, ed. (1913). "Judaizers". Catholic Encyclopedia. New York: Robert Appleton Company. "The Coptic Christians in Egypt and the Ethiopian Orthodox Christians— two of the oldest surviving forms of Christianity— retain many of the features of early Christianity, including male circumcision. Circumcision is not prescribed in other forms of Christianity... Some Christian churches in South Africa oppose the practice, viewing it as a pagan ritual, while others, including the Nomiya church in Kenya, require circumcision for membership and participants in focus group discussions in Zambia and Malawi mentioned similar beliefs that Christians should practice circumcision since Jesus was circumcised and the Bible teaches the practice." ↑ Mattson CL, Bailey RC, Muga R, Poulussen R, Onyango T (2005) Acceptability of male circumcision and predictors of circumcision preference among men and women in Nyanza province Kenya. AIDS Care 17:182–194. ↑ For example, "The Calendar of the Church Year" in The (Online) Book of Common Prayer (Episcopal Church in the United States of America), retrieved 11 October 2006. ↑ Castellsagué, X; et al. (2005). "Chlamydia trachomatis infection in female partners of circumcised and uncircumcised adult men". Am J Epidemiol. 162 (9): 907–916. doi:10.1093/aje/kwi284. PMID 16177149. ↑ Lajous, M; et al. (2006). "Human papillomavirus link to circumcision is misleading (author's reply)". Cancer Epidemiol Biomarkers Prev. 15 (2): 405–6. doi:10.1158/1055-9965.EPI-05-0818. PMID 16492939. Circumcision is not usually performed by public sector health care providers in Mexico and we estimate the prevalence to be 10% to 31%, depending on the population. 1 2 3 4 5 6 7 8 9 "Male circumcision: Global trends and determinants of prevalence, safety and acceptability" (PDF). World Health Organization. 2007.